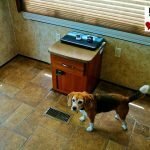 Every six months or so I wash, wax and detail the RV. Occasionally between this it may get a quick wash if it gets very dirty or dusty, usually after a couple big rainy drives or a desert windstorm. Below you will learn the methods, tools, and products I use to carry out the task. Just a few words about safety. 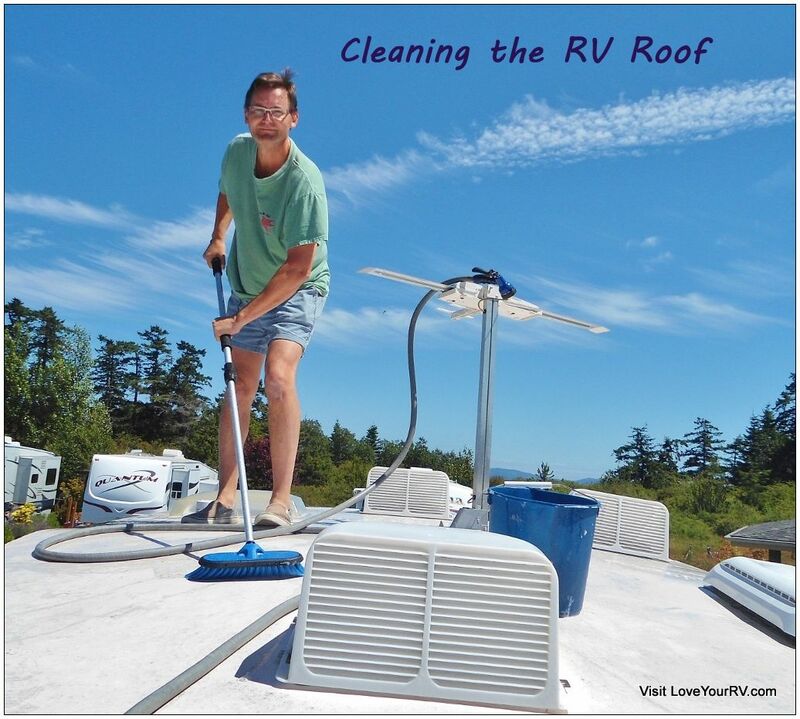 To clean and wax the RV can involve ladders and time on the roof. If you’re not physically up to the task don’t try it, instead pay for the service. 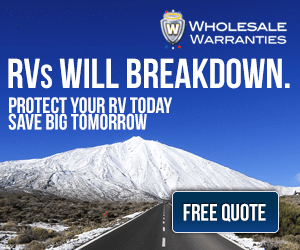 Falling off an RV roof can seriously injure or kill you. Working at that height shouldn’t be considered lightly. Up on the roof, I use a boating type deck shoe with very good gripping soles and stay in the middle, avoiding as much as possible being near the edges. Also take your time and be organized this not a place to be tripping over things. When climbing the ladder to reach high areas it’s a good idea to have someone hold the ladder for you. Always have someone around so if you do fall they can quickly get help. 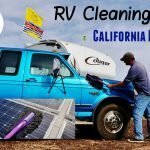 It’s best to clean the RV from the top down. First thing I do is head up on the RV’s roof. 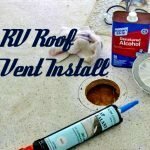 I remove my vent covers and wash the EDPM rubber roof with a mixture of Dawn dish detergent and hot water using a soft bristled brush on an extension pole. I generally do a 6’x6’ section at a time starting from the front and working back. Sometimes a second or third washing is needed to get all the dirt off. 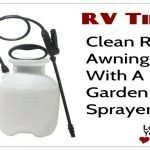 For any heavily soiled areas or stubborn stains, I use a full-strength application of spray on Rubber Roof cleaner. I also go along and clean out the gutters really well removing any stuck debris. Finally, I will inspect all the sealant around the roof vents, air conditioner and all roof seams for signs of cracks or deterioration. 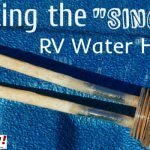 With the same long-handled soft brush, I will do all the RVs side walls and back using a standard RV washing soap. I pay special attention to the seams where the wall joints, storage bay doors, marker lights, and appliance outlets are. This is where the majority of the dirt and grime will accumulate, sticking to the silicone sealant. I give these areas a good scrubbing, not hard enough to damage the seal but enough to clean out the dirt and leave the seal looking nice and white again. 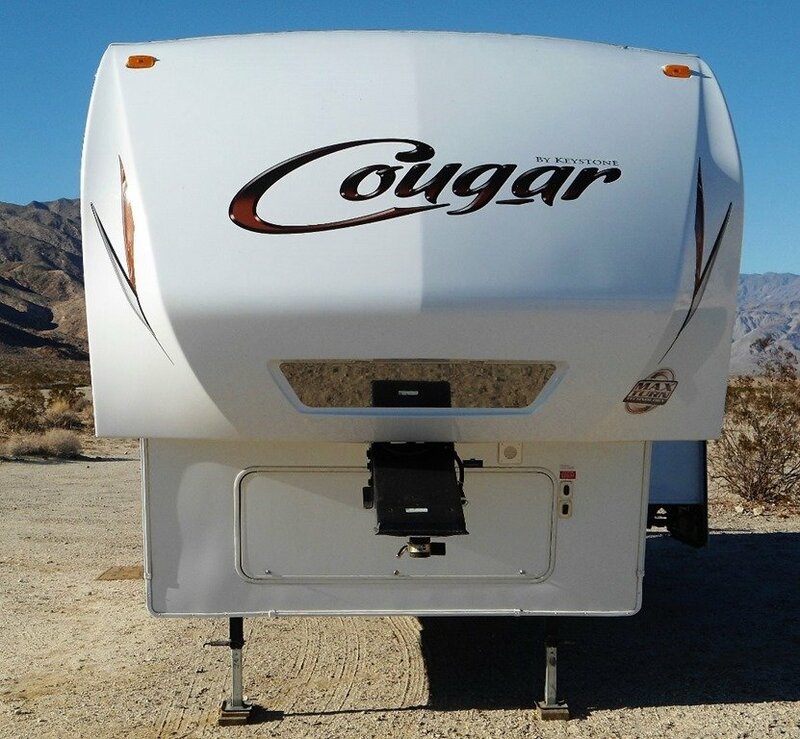 The front of the RV, in my case the fifth wheel fiberglass cap, demands a little more specialized cleaning. This is where during road travel all the bug abuse takes place. Sometimes the carnage can be enormous! The best defense against super stuck on bug guts is a very well waxed front cap. The best method I have found to remove the squashed little buggers is with a dryer sheet. First wet down the area and the dryer sheet and if you have a decent wax underneath they will come off fairly easily. To access the higher areas just put the dryer sheet under the brush and scrub. 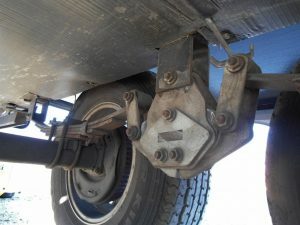 For the undercarriage hardware and tires I’ll use a little stiffer brush and scrub of any dirt and debris from the landing jacks, stabilizers, slide rails, steps, rear bike rack and bumper, suspension parts,etc. 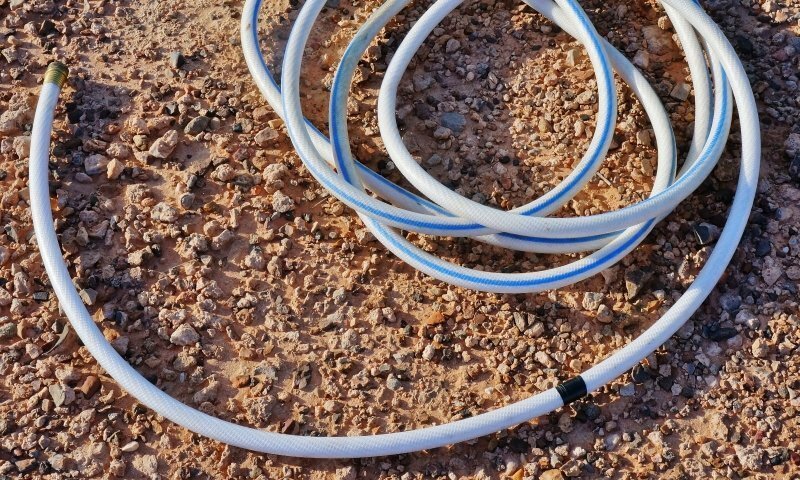 Then give everything a really good rinsing at high pressure and an application of dry type lubricant to avoid attracting dirt. My favorite is Protect-All Slide out Dry Lubricant. The wheels get a good cleaning with soap and water, then some UV protectant on the tires and aluminum polish for the mag wheels. After a general clean with the soap and water, the windows get a wiping with Windex glass cleaner. Then all the rubber seals for the windows and slide outs get a coating of rubber conditioner such as Protect-All slide-out rubber seal treatment. This is a good time to check bug screens for holes and tears, window hardware functionality and inspect the slide out seals. 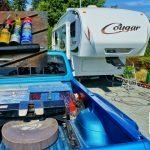 Waxing the RV is a huge task. Compared to a car it has a massive surface area. So once a year I will do the job with a paste type, wipe on and buff off type wax and then in between I use an easier spray on and wipe off express wax. 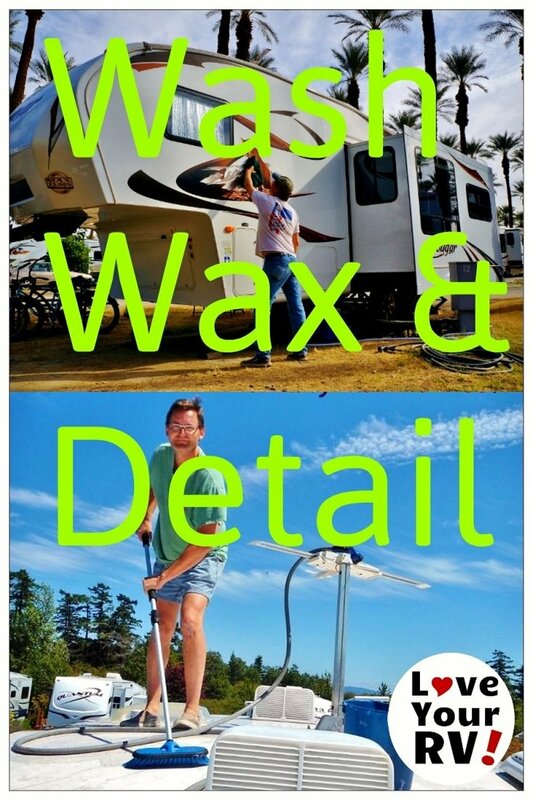 I use a paste wax called RV, Boat & Aircraft Wax P-38-Q. It’s a high-quality product and gives a long-lasting coat. The spray-on wax variety I like is called Protect-All Surface Cleaner. It does a great job fast. Both of these waxes have proved to be safe on my units decals and plastics with no signs of fading in the four years I’ve had the RV. For application and buffing, I prefer to use some soft clothes versus an electric buffer. My unit has a Filon type coating and I’m not 100% sure if it could be damaged by too aggressive of buffing so I error on the side of caution. The front fiberglass cap as mentioned before gets some extra attention, usually 2 or 3 coats to make it super slick. 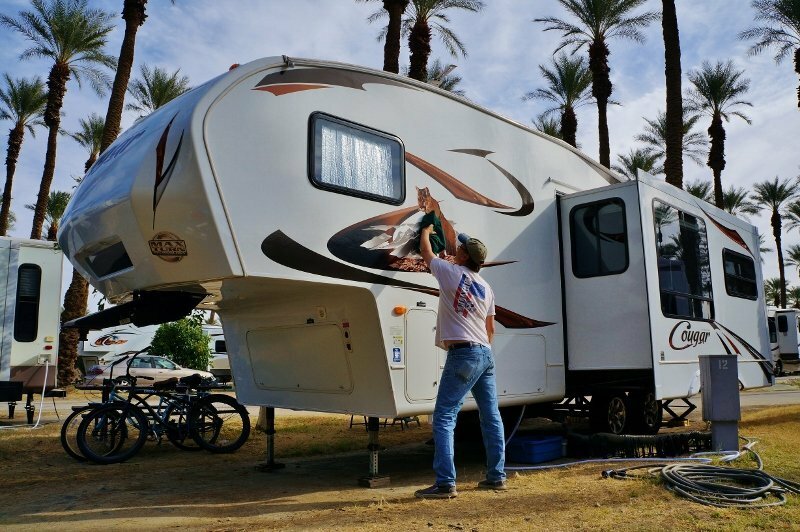 I find while waxing it’s a great time to have a detailed inspection of all the areas of the RV surface and seams for any problems that may be missed with a quick look. 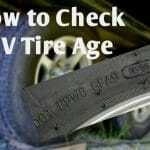 Because everything is freshly clean it makes it easy to spot that little crack in sealant or loose trim, allowing me to nip a potential problem in the bud. There, what a beautiful RV. It is now time to crack open your favorite beverage and sit back and admire that gleaming rig. Best to let it all soak in quick because that next rain, dust storm or mud covered adventure is on its way. Generally the dirtier the RV gets the more fun your having. Cheers, Ray.